Just got a new camera a few days ago, and it seemed like the perfect excuse for my first post on this blog. So, how do the pictures look? The recipe itself is pretty simple, and the flavors are good. 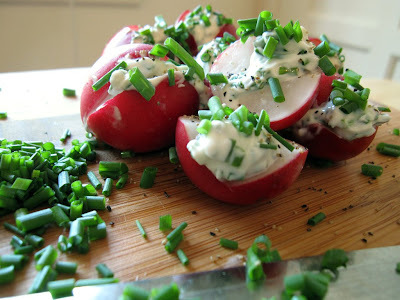 The cooling cream cheese really balances out the peppery taste of the raw radishes. Chop the chives, and mix in with the cream cheese. I used a lot of chives, roughly the same in volume as the cream cheese. After cleaning the radishes, slice them radishes in halves. 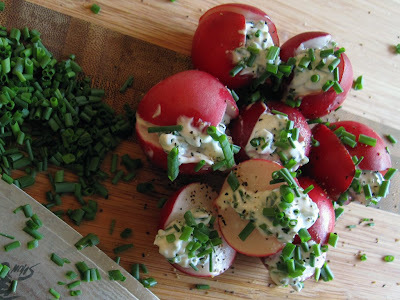 Spread cream cheese on the radishes, sprinkle on salt and pepper, some more chives, and enjoy! The recipe pandora bracelet itself is pandora charms pretty simple, and the pandora norway flavors are good. pandora bracelets The cooling pandora charm cream cheese really balances out the peppery taste of the raw radishes.